Observation - Fruticose lichen - UK and Ireland. 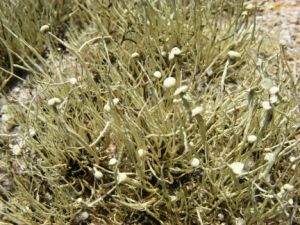 Description: Growing on weathered granite boulders just above high waterline on a west facing sandy beach, this silvery fruticose lichen formed a substantial carpet. It is showing what may be fruiting bodies on long stems. Growing on weathered granite boulders just above high waterline on a west facing sandy beach, this silvery fruticose lichen formed a substantial carpet. It is showing what may be fruiting bodies on long stems.